Computer users have different requirements when it comes to ripping DVD and Blu-Ray movies to their computer system. All obviously want the ability to rip any DVD or Blu-Ray disc, regardless of protection. It becomes less clear when you look at the contents, the usability or the output formats. 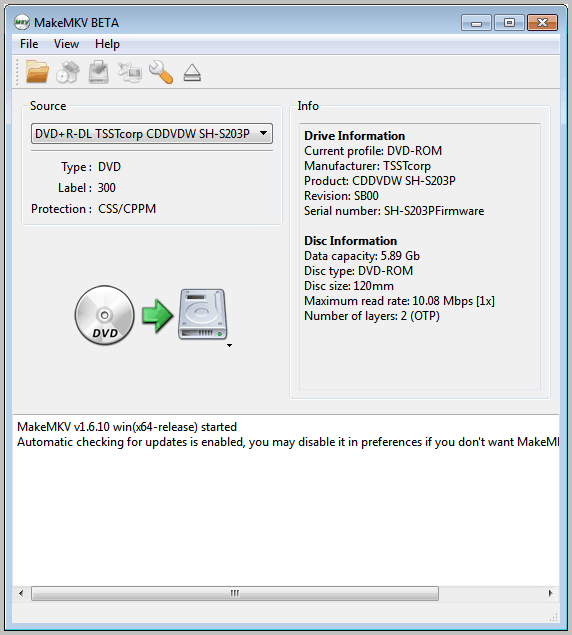 MakeMKV is a Blu-Ray and DVD ripper that is dead easy to use. It actually takes only a few clicks to turn any DVD or Blu-Ray disc into an MKV file on the computer hard drive. Even better, it is possible to include all the information and chapters on the disc, including HD audio or chapter information. Here is how it works. Make MKV is available for Windows and Mac. Windows users need to install the program before they can use it. To rip a DVD video or Blu-Ray video disc they need to start the program, insert the disc into the drive and click the rip button that is displayed prominently in the program interface. Make MKV will analyze the disc and display title information on the next screen. Titles with less than 120 seconds of playtime are skipped automatically, which can be changed in the program options. All titles are displayed in the interface with the possibility to include some or all in the resulting mkv video file. You can select an output folder on the same screen, or keep the default output folder that you can configure in the preferences. A click on the Make MKV button rips the selected titles from the DVD or Blu-Ray and saves it as an MKV file to the local system. The ripping and converting is relatively fast. It took about 12 minutes to rip and convert a full DVD movie to the hard drive. Each title is saved as a mkv file to the selected output directory. The program can read Blu-Ray discs that are protected with the latest versions of AACS and BD+, as well as DVDs that make use of DVD copy protection. Make MKV is currently offered as a free beta version. The developers seem to have plans to offer a free and commercial version of the application after beta. The free version will be able to turn DVD discs into video files, while some or even all of the Blu-Ray ripping capabilities may end up in the commercial version. For now though, everything is free. Interested users can download Make MKV from the developer website of the same name. This program works fantastic. The only problem I have with it that keeps me using Handbrake for DVD conversions is that it doesn’t handle forced subs on DVDs and therefore I miss out on what the Klingons or aliens or Germans might be saying. I definitely like the MakeMKV simplicity and speed much better than Handbrake so I’m hoping the developer will get a fix for that one minor hiccup. Good point about the subs, have not paid attention to that at all. As insominiac says, the subtitle rpoblem is a n-ono if you’re fond of foreign movies. For me, the filesizes are a problem too – there doesn’t seem to be a way of reducing them. Most folk like mkv becauseof the good quality and small filesizes – turning a 5gb movie into a 5gb mkv doesn’t interest me. That said, this is a very promising application – nicely laid out and very easy and intuitive to use. Not for me right now, but I’ll be keeping an eye on it. Very nice software. Does what it says on the tin! I have Handbrake and AppGeeker DVD Ripper installed on my computer to cover all basic and advanced options when both of them handle the job well. It is kinda fun to test new program and see result.